or someone with new eyes. at my booth space for months. and has a place where a cord could once have been. but had one similar at home painted gold. I never could understand why no one wanted it. It was only a few dollars. No one saw in it what I saw. Last week when I made a visit, it was still there. I have been reminded about the importance of prayer. And for all those we do not know. that we can help others who are in need. Please visit Kathleen at Faded Charm. Have a blessed White Wednesday. Thanks for in inspiring post! Yes, indeed, those beautiful hands clasped in prayer do belong with you! Oh, this was beautifully said.. I love your vignette..the hands are beautiful... how are things down your way? Have you had the heavy fog like we've had up here around the Kansas City area? Gosh girl.. we're ready for some sun... hope all is well your way..
Beautiful post, Deb! I am so glad that you brought the praying hands home. They look beautiful in your holy vignette. Lovely post, and even though we can't be there in person to help in Haiti, we can all remember to pray. God answers prayer! What an absolutely beautiful post Debra (inside and out!) ---guess that is why they never sold--they were meant for you to keep. I so love decorating with religious artifacts and noticed lots and lots in the Jean D'Arc magazine. When you described it to me earlier today, I couldn't have imagined how lovely it truly is. Wonderful post...the hands are beautiful and look lovely on your table. They were meant to be yours. It always amazes me that when something doesn't make sense (like those hands not selling) and then later it does make sense (those hands were suppose to be yours) God had a time for them to be in your house, and that time was obiviously now. They were meant to be in your home! Beautiful and meaningful vignette! Oh how beautiful! Great words... yours and HIS! Love those hands and your sweet vignette. Enjoy your day, dear Debra! Wonderful post ... thank you. I agree,the praying hands were meant for you to keep ... they complete this vignette perfectly ... adding so much significance. Oh Debra what a truly special vignette!!! It's just beautiful! I love it!! Glad you decided to bring it home and keep it for yourself! What a truly beautiful and serene post. Just reading it gave me such a peaceful feeling. Beautiful post, Debra...and very special vignette. We are glad the praying hands went home with you! A Beautiful vignette for Haiti. And of course our prayers are with them. Thanks so much for the beautiful and moving post. It is inspiring. I'm so glad you did go back and get the praying hands. They speak without saying a word. And I loved the vignette with the lantern and the Scriptures and the cross and the Hands. The entire tabletop is lovely. Prayer is the pipeline between our heart's cries and desires and hopes and dreams.. and the most Holy ear of our Heavenly Father. He IS always listening. What a sacred blessing. Truly He loves us. Thank you for sharing eye and heart beauty today. You are such a precious blessing to my heart what a truly uplifting post. The power of prayer often goes unspoken yet we all need that reminder how powerful it is to lift our voices and hands unto Him. Have a day filled with love and joy. A truly beautiful, beautiful post Debra. And I love every picture in it too my friend. Right now is the time to use our hands for praying and for helping those in need. What a thoughtful and special vignette you've created. I love how it turned out. Hope you are having a nice week. Loved this entire post. From the Bible verse to your vignettes. I do the same things sometimes. I take something to my booth and can't understand why it won't sell and end up taking it home. You will enjoy your praying hands for some time to come I am sure. A beautiful vignette, and a concrete reminder to be vigilant with our prayers! This was beautiful. 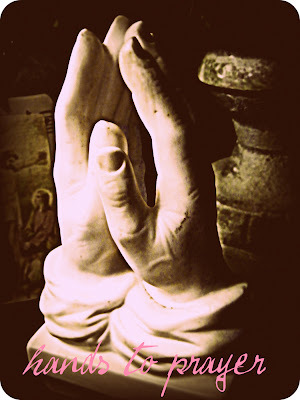 My grandmother has had a praying hands sculpture for as long as I've been alive. I love it. It always seemed so calm and confident. The sight of the praying hands makes me pause and breathe a prayer.